How Can Innovative Technology Make Conflict Prevention More Effective? I’ve been asked to participate in an expert working group in support of a research project launched by the International Peace Institute (IPI) on new technologies for conflict prevention. Both UNDP and USAID are also partners in this effort. To this end, I’ve been invited to make some introductory remarks during our upcoming working group meeting. The purpose of this blog post is to share my preliminary thoughts on this research and provide some initial suggestions. Meier, Patrick. 2011. Early Warning Systems and the Prevention of Violent Conflict. In Peacebuilding in the Information Age: Sifting Hype from Reality, ed. Daniel Stauffacher et al. Geneva: ICT4Peace. Available online. Meier, Patrick. 2007. “New Strategies for Effective Early Response: Insights from Complexity Science.” Paper prepared for the 48th Annual Convention of the International Studies Association (ISA) in Chicago.Available online. That said, colleagues at IPI should take care not to fall prey to technological determinism. 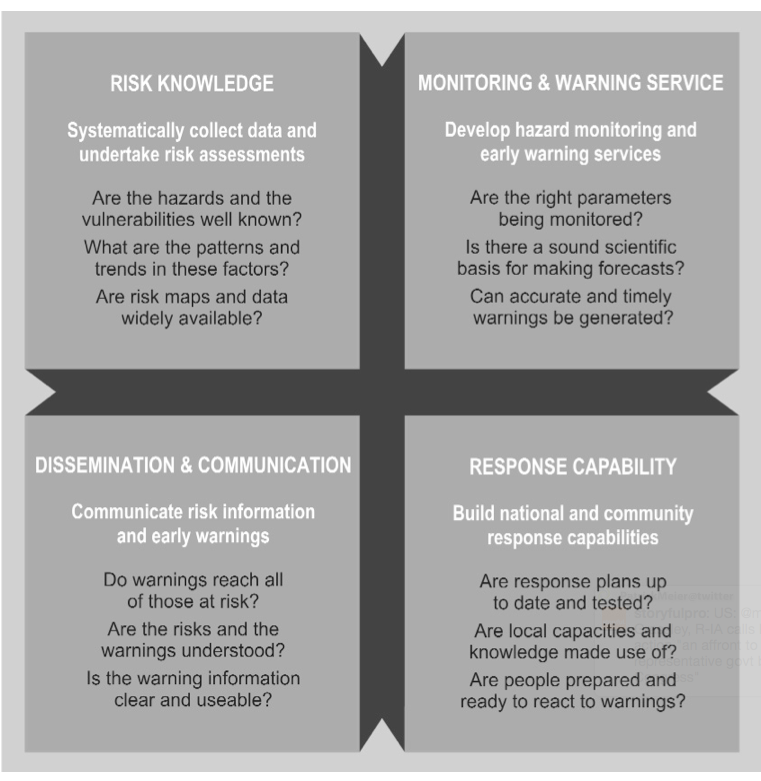 The first order of business should be to understand exactly why previous (and existing) conflict early warning systems are complete failures—a topic I have written extensively about and been particularly vocal on since 2004. Throwing innovative technology at failed systems will not turn them into successful operations. Furthermore, IPI should also take note of the relatively new discourse on people-centered approaches to early warning and distinguish between first, second, third and fourth generation conflict early warning systems. On this note, IPI ought to focus in particular on third and fourth generation systems vis-a-vis the role of innovative technology. Why? Because first and second generation systems are structured for failure due to constraints explained by organizational theory. They should thus explore the critical importance of conflict preparedness and the role that technology can play in this respect since preparedness is key to the success of third and fourth generation systems. In addition, IPI should consider the implications of crowdsourcing, crisis mapping, Big Data, satellite imagery and the impact that social media analytics might play for the early detection and respons to violent conflict. They should also take care not to ignore critical insights from the field of nonviolent civil resistance vis-a-vis preparedness and tactical approaches to community-based early response. Finally, they should take note of new and experimental initiatives in this space, such as PeaceTXT. IPI’s plans to write up several case studies on conflict early warning systems to understand how innovative technology might (or already are) making these more effective. I would recommend focusing on specific systems in Kenya, Kyrgyzstan Sri Lanka and Timor-Leste. Note that some community-based systems are too sensitive to make public, such as one in Burma for example. In terms of additional experts worth consulting, I would recommend David Nyheim, Joe Bock, Maria Stephan, Sanjana Hattotuwa, Scott Edwards and Casey Barrs. I would also shy away from inviting too many academics or technology companies. The former tend to focus too much on theory while the latter often have a singular focus on technology. Many thanks to UNDP for including me in the team of experts. I look forward to the first working group meeting and reviewing IPI’s early drafts. In the meantime, if iRevolution readers have certain examples or questions they’d like me to relay to the working group, please do let me know via the comments section below and I’ll be sure to share.